Light up your party with the City Night Backdrop. Hang the Starry Night Backdrop and the City Scape Backdrop on the wall to create an outdoor city night scene. The City Night Backdrop scene makes a great background. You can stand in front of it and snap photos. Or you can hang it up and let it alone allowing to set the scene for your party. 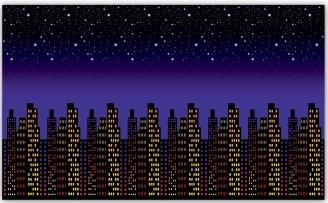 Bring this City Night scene indoors with the Starry Night Backdrop and the Cityscape Backdrop. This City Night scene will sure to be a hit with your guests at your next Hollywood, Red Carpet, or VIP event. The backdrops are made of a thin plastic material, and each are printed with their own specific scene. You'll hang the Starry Night Backdrop and the Cityscape Backdrop up with double sided tape or thumbtacks. When combining the Starry Night Backdrop with the Cityscape Backdrop you will create an eight feet tall by thirty feet long scene that will make your guests Ohhhh! and Ahhhh! You’ll all feel like superstars when you stock up on these party supplies and party decorations!